accessories « Tech bytes for tea? It’s November and Christmas is less than two months away, this series of reviews serves up gift ideas for those planning to buy presents for your friends and loved ones – or yourself. Keep a lookout for tech4xmas giveaways to build up the yuletide cheer. The tech4xmas reviews are meant to provide ideas and start you off, so do check out some of them online and in the shops if they are what you think would bring a smile to your loved ones this Christmas. With Christmas 2017 less than two months away, it’s a good time to begin planning gifts for those that are close to us. So this series (see list below) features quick and easy-to-read reviews of some of the best tech gadgets/products that I’ve personally tried. For travellers that hate the bulkiness of the British 3-pin plug, the Flip plug allow the plug to be folded into a compact flat form factor for packing away into the luggage bag. Prices below. The Flip comes in three designs to cater to varying power needs. 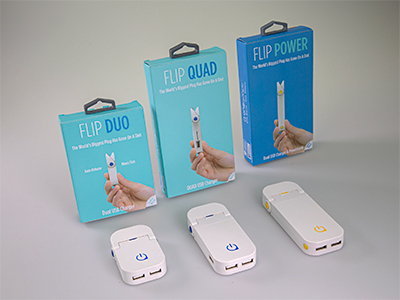 From left: Flip Duo (S$39), Flip Quad (S$59), Flip Power (S$69). The Flip is the result of a successful Kickstarter campaign which raised £28,115 from 1,140 backers, exceeding their initial goal of £15,000. The Flip Duo (S$39), Flip Quad (S$59) and Flip Power (S$69) plugs are now available at all Antė stores, EpiCentre, iStudio, Robinsons, TwoBros Lifestyle & Gadget Store and We the People. Each purchase includes One (1) Year Limited Warranty. Measuring in at a mere 18mm when folded, the Flip is only a third of the standard British plug’s thickness. When folded, the pins are hidden away when not in use, protecting your devices and other items from scratches when stored together with the Flip. To use, simply press the auto-release button, lock the pin and you are ready to go. The Flip comes in three designs to cater to varying power needs. So Christmas is now less than two months away, this series of reviews serves up gift ideas for those planning to buy presents for their friends and loved ones. Planning your Christmas shopping? Stay tuned for quick and easy-to-read reviews of some of the best-in-class gadgets available today. With Christmas 2016 less than two months away, it’s a good time to begin planning gifts for those that are close to us. So this series features quick and easy-to-read reviews of some of the best tech gadgets/products that I’ve personally tried. Not all are the latest and newest, but they are what I think are some of the best-in-class in their category of products. The reviews are meant to provide ideas and start you off, so do check out some of them online and in the shops if they are what you think would bring a smile to your loved ones this Christmas. Have been using this beautiful workhorse during Strata + Hadoop World in Singapore. Surpassed all expectations. Love how it’s compact yet has two full-sized Type-A USB 3 slots & a Type C slot. More details have been released by Samsung for Galaxy Note7 users in Singapore, covering the refund value for the Note7, trade-in prices to the S7 Edge, as well as refund for original Note7 accessories. This is in addition to earlier information Samsung Singapore had released earlier. All Galaxy Note7 customers are required to back up their data using Samsung Smart Switch (http://www.samsung.com/sg/support/smartswitch/), delete any data or other personal material stored in the device, and reset their device ahead of the home delivery. Galaxy Note7 customers who opt to exchange their device for a Galaxy S7 edge, valued at S$1,098, will receive an additional S$250 in cheque. For more information or further assistance, consumers can visit Samsung’s Note7 exchange website or call 1800-SAMSUNG (726 7864). Those who opt for a refund will receive the full retail value of the Galaxy Note7 at S$1,168 in cheque. Both options are available to all Galaxy Note7 customers, regardless if they purchased their original device from telecommunication operators, consumer electronics stores, authorised retailers, Samsung Official Store at Lazada.sg or Samsung Experience Stores. The options also do not affect any pre-existing contract that the Galaxy Note7 owner has with the telecommunication operators. The CREATE Keyboard Case for the 9.7-inch iPad Pro is available from today at S$219. The CREATE Keyboard Case design offers all around protection with custom sculpted Curves to provide structural integrity, protecting your iPad Pro on the inside; while on the outside the tightly woven fabric resists bumps, scratches and spills. Image: Logitech. The CREATE Backlit Keyboard Case with Smart Connector for the 9.7inch iPad Pro serves as a protective case, a backlit keyboard, and an integrated holder for the Apple pencil. The foldable keyboard connects wirelessly to mobile devices via Bluetooth 3.0 and is available in Singapore for S$89 at CumulusNimbus and Antė stores. The lightweight compact keyboard measures only 7mm thick, 89mm (3.4 inches) wide and only 140mm (5.5 inches) when folded. When unfolded, the length doubles to 11 inches (280mm). Lamch & Co is introducing to Singapore the Foldboard by Casestudi. The Bluetooth 3.0 Wireless Foldable Keyboard connects with iOS, Android and Windows 10 devices and boasts a usability range of up to 8 meters away from your connected device. The Casestudi Foldboard comes with gold, corkwood or black exterior designs. The 80-keys US keyboard layout comes fully equipped with shortcuts and features key caps made of highly durable, impact and scratch resistant polycarbonate.